We made my second visit this month to Island Lake Rookery. We spent the weekend at Long Lake and stopped by Island Lake on the way home. 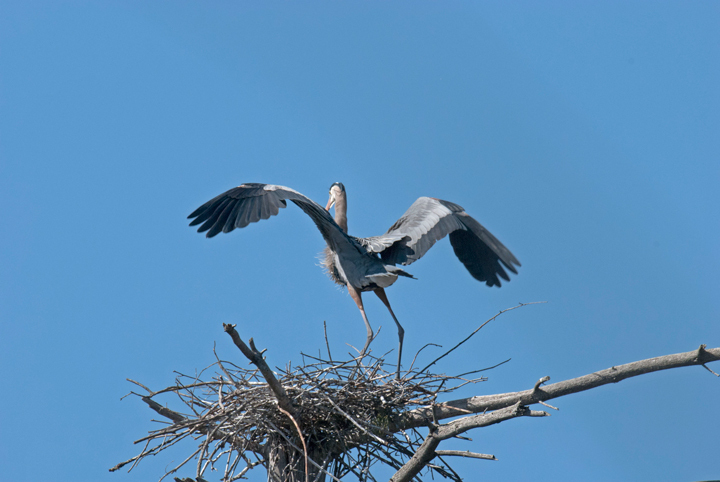 In an earlier blog I had mentioned that there were fewer Blue Herons nesting at the rookery this year. When we stopped yesterday almost all of them were gone. 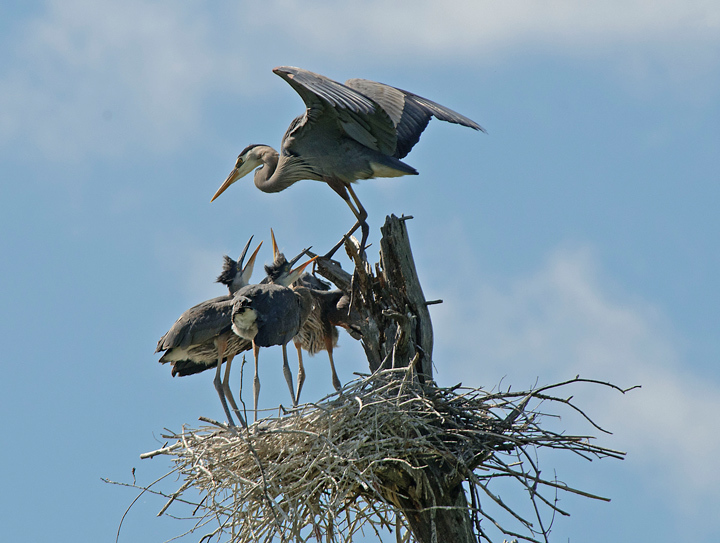 There were a few lone herons perched on a some of the nests. I think we counted six herons in all and most of those were on the ground. The Ospreys were still in their nest. At one point both parents were bringing food to the two young in the nest. From the looks of things the young were about to leave the nest. They were standing tall and testing their wings. Both parents were on trees near the nest calling to the young in an attempt to them to fly from the nest. 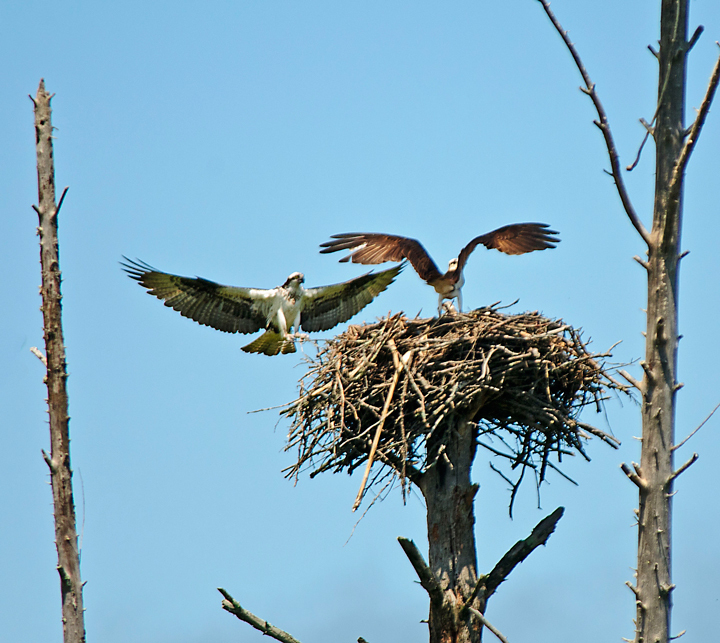 This is a shot of both parents arriving at the nest at the same time. The Green Herons were around but it took a while to find them. It was early in the afternoon and they were perched a couple of different places grooming themselves. In the time we were there they didn’t fly at all so we were lucky to spot them. As noted in my previous blog posting my wife and I stopped at Island Lake Rookery over the 4th to see what was going on in the rookery. This was my second visit to the rookery this spring. I had stopped early in the spring just as the birds were arriving and setting up nests. My impression, at that time, was that there were fewer birds than last year but I thought it might be because it was early in the year and the young were not in the nest. Unfortunately, I had the same impression from the last visit. Many of the nests were not occupied this year. Last year there were hardly any empty nests. Not sure what is going on. 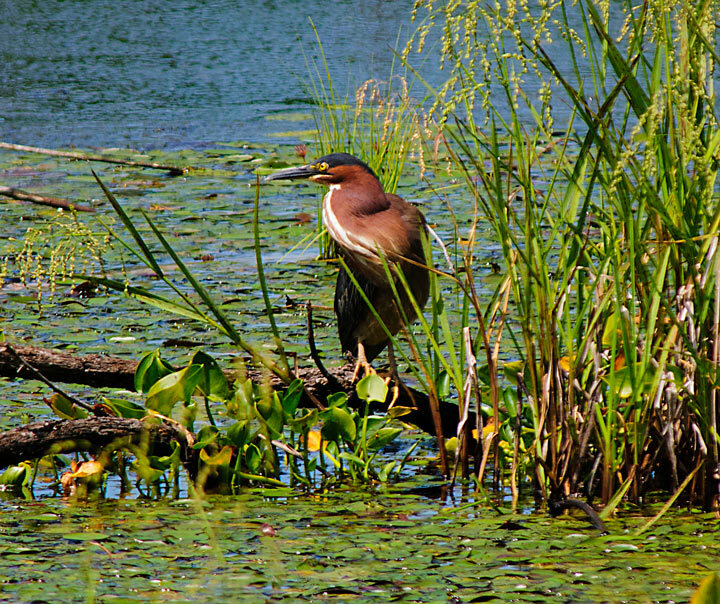 Island Lake is a great place for photography because it is next to a road and there is a clear view of the rookery. What attracted me to this rookery was the large number of Blue Herons and the fact you could easily view them from the road. Right now the young are almost as large as the adults. It is a real treat to watch when the adult returns with food. This particular adult tried to do the feeding from the branches above the nest but kept falling off into the nest. It is quite a racket when the parent returns with food. 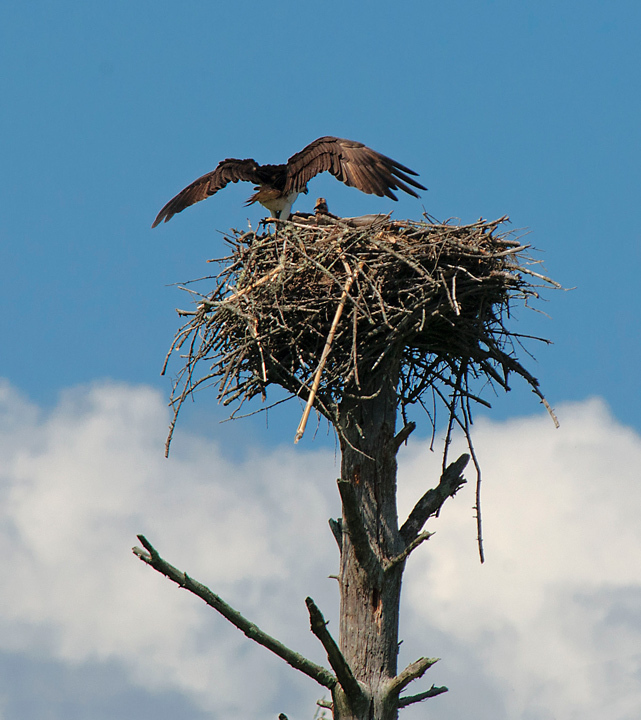 Another attraction, at the rookery, is an Osprey nest. When we first arrived there appeared to be an adult on the nest and a Bald Eagle on another perch some distance from the nest. I thought this was a little strange because the two don’t get along. When I looked through the camera it was apparent that both were adult Osprey. there are several young in the nest. I would think they should be up and about in the next few weeks. The other bird we watched for quite some time was a pair of Green Herons. One came over by the road so were able to watch it up close as it hunted. 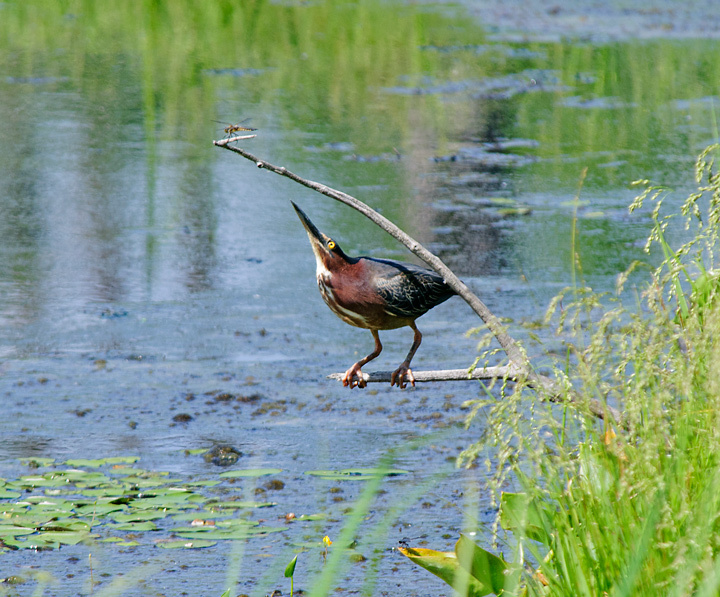 I only wish I had as much patience as the Green Heron does. It sat on a branch and waited for dragonflies to land on the branch above it. This shot shows it eying lunch. It also managed to catch a frog from the same perch.